"We are so grateful to have known and loved Leonie." "Rest easy Aunt Leonie love always Marcel and Debbie Nadeau"
"Rest in peace Aunt Leonie. I will never forget the first..."
"So sorry to hear about your mother. 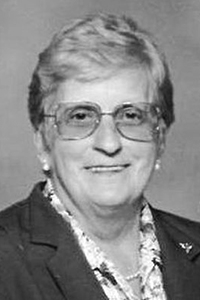 My condolences to the..."
SCARBOROUGH - Leonie Pierrette (Nadeau) Frenette, 87, passed away on March 22, 2019, at Scarborough Terrace with her family by her side. She was born in St. Martin, Canada, on June 4, 1931, the daughter of Charles and Salomie Roberge Nadeau. She was born the 14th child in a family of 15 children. Leonie was strong from the beginning. She loved to tell the story of how she was born a premature twin, where her sister, Leonne, did not survive, and how her family kept her warm by putting her in a shoe box and placing her on the bread warmer shelf of the kitchen stove, and how she was run over by a horse and buggy at the age of four. Growing up on a farm, she was given chores at an early age. She would have to milk the cows before school and on Fridays, her mother would send her to catch trout at a nearby brook for the family dinner. At the age of 13, Leonie lost her mother. She was sent to live at the local convent with two of her sisters and then was taken in and raised by her beloved paternal grandmother, Elizabeth Joly Nadeau. Leonie met her future husband, Jules Frenette, while playing baseball. While she was not the best player, Jules would always pick her to be on his team. They were married April 18, 1949, in St. Martin, Canada. Together they had three children. In 1957, Leonie moved to Stratton and then to South Portland where they lived for over 50 years. She and Jules loved to spend time with their children, taking them for outings at Kiwanis Beach, digging clams and cooking them at Reid State Park, and enjoying the ocean at Crescent Beach. She loved to spend time with friends and family. She was like a second mother to many, many of her nieces and nephews. She was a member of St. John the Evangelist Church in South Portland and the Sacred Heart. Through the years, she worked at Fairchild Semiconductor, Cumberland Farms, Burger King, Pond Cove School in Cape Elizabeth and then retired from Shaw's in 1992. Through this time, she also kept the books for her husband's general contracting business. She was well liked and made many friends wherever she worked. After retiring, she and Jules loved to volunteer at their church, the local soup kitchen and Meals on Wheels. From 1992 to 2000, they enjoyed winters in Ormond Beach, Fla., where they continued to volunteer at Meals on Wheels there. Leonie moved to Scarborough Terrace in October 2011. The family would like to extend a huge thank you to the staff of Scarborough Terrace for the many years of loving care they provided to her. Leonie was predeceased by her husband, Jules, in 2013; and by her daughter, Rita Colucci, in 1992. She is survived by two sons, Guy Frenette and wife, Carole, of South Portland, and Benoit and wife, Viola, of Buxton; seven grandchildren, two step grandchildren; 10 great-grandchildren, three step great-grandchildren; and two great great-grandchildren. Visiting hours celebrating Leonie's life will be held on Friday, March 29 from 4-6 p.m. at the Conroy-Tully Walker South Portland Chapel, 1024 Broadway, South Portland. Prayers will be recited at the funeral home on Saturday, March 30 at 10:15 a.m. followed by an 11 a.m. Mass of Christian Burial at St. Maximilian Kolbe Parish, 150 Black Point Road, Scarborough. Private interment will be held at Calvary Cemetery, South Portland. To view Leonie's memorial page, please visit www.ConroyTullyWalker.com.